The Egoscue Method (www.egoscue.com); Zen Therapy (www.zentherapy.org/html/about.html) – which is a combination of Rolfing (www.rolf.org/about/index.htm); Feldenkrais (www.feldenkrais.com); and Trager work (www.tragerus.org) work; and traditional Neuromuscular and Massage therapies; . Marty has been trained in these modalities and is also a teacher to therapists and instructors in various aspects of Bodytherapy. He is often consulted by peers to aide in the treatment of difficult cases. What does Bodytherapy address? Bodytherapy is effective at treating most of the musculoskeletal, chronic pain and stress related injuries you would go to the doctor, chiropractor, massage or physical therapist for. 1. To teach clients to understand their pain or chronic condition and empower them with information to become the expert in their own rehabilitation. 2. Bodytherapy releases the natural, pain free form of the body that has been bent, twisted and collapsed over a lifetime of modern living, physical / emotional trauma and repetitive and restricted use. How does Bodytherapy work? You will receive 10 deep tissue sessions following a specific recipe for unwrapping, aligning & balancing the human body. In each bodywork session you are being treated on a massage table, with shorts, tank top or similar, doing various movements as the therapist does advanced soft tissue techniques. Custom self care exercises designed to improve posture, alignment and address distortions that lead to orthopaedic conditions. Movement therapies to foster body awareness, the release of muscle guarding and reeducation of the muscular system promoting ease of movement and wellbeing. Self care education to understand how and why you hurt and create proactive solutions. Why choose Bodytherapy? Choosing Bodytherapy teaches self-reliance in a doctor / therapist reliant health care based system. Bodytherapy targets underlying causes of symptoms then addresses these symptoms and the root cause of the original problem. 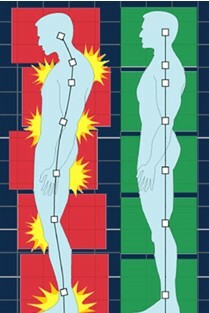 YES: If you have tried other modalities and still have issues. YES: If you want a comprehensive method to elevate your health, body, and performance. NO: If you think your doctor is in charge of your health and you have no control. Clients report: being more relaxed, able to perform at a pre-injury or condition level, significantly less, little or no pain, taller (yes taller) posture and increased performance at work and in sports activities. Marty can be reached at (704.335.8115 or mkestin@ensomabodywoks.com) for free face-to-face or phone consultations. All new clients receive 50% off their first session.